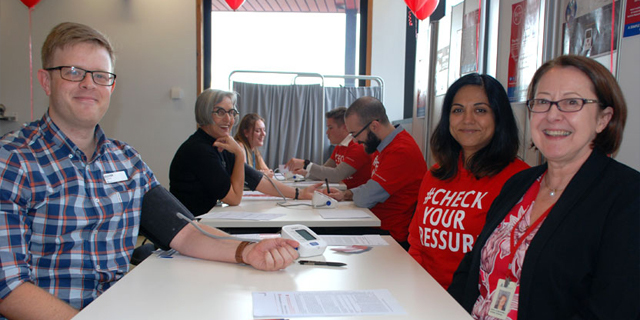 Photo: Elizabeth Austin Registrar Dr. Oliver Piercey has his blood pressure checked by Dr. Sheila Patel and Prof. Louise Burrell for May Measurement Month yesterday at the Melbourne Brain Centre. Professor Louise Burrell is an author of an article in The Lancet Global Health, describing the results of the world's largest international blood pressure screening program. The program - May Measurement Month 17 - screened 1.2 million adults in 80 countries during May 2017. It found more than 150,000 people had untreated hypertension, or high blood pressure, and more than 100,000 who were receiving anti-hypertensive treatment did not have their blood pressure under control. "High blood pressure is the number one risk factor for global death. However, many people don't know that they have hypertension. It has no symptoms, and some people only find out when they have a stroke or heart attack," says Prof. Burrell, who is Acting Director for Austin Health's Department of General Medicine, as well as Professor of Medicine and Head of the Cardiovascular Research Group at The University of Melbourne. "This is the largest screening program in the world to measure blood pressure," she says. As well as alerting significant numbers of people to their own high blood pressure, Professor Burrell says that the 2017 May Measurement Month campaign showed that that volunteer mass screening is not only possible but highly cost-effective at ~ 22c per screen, and $1 per person identified with hypertension. The data generated will also allow exploration of the association between blood pressure levels and other characteristics and environmental factors. May Measurement Month is a useful and reasonably inexpensive tool to help raise awareness of high blood pressure in the general population, and potentially among health policy makers, and to thereby help address the burden of disease caused by hypertension. The article was published on May 17, 2018, which coincided with World Hypertension Day and 2018 May Measurement Month. May Measurement Month is an initiative led by the International Society of Hypertension (ISH) and endorsed by the World Hypertension League. Professor Burrell, Chair of the ISH International Forum, and her colleagues from General Medicine and the University of Melbourne launched Austin Health's contribution to May Measurement Month 2018 in the Melbourne Brain Centre, performing blood pressure checks on staff, students and visitors to add to the global data collection.